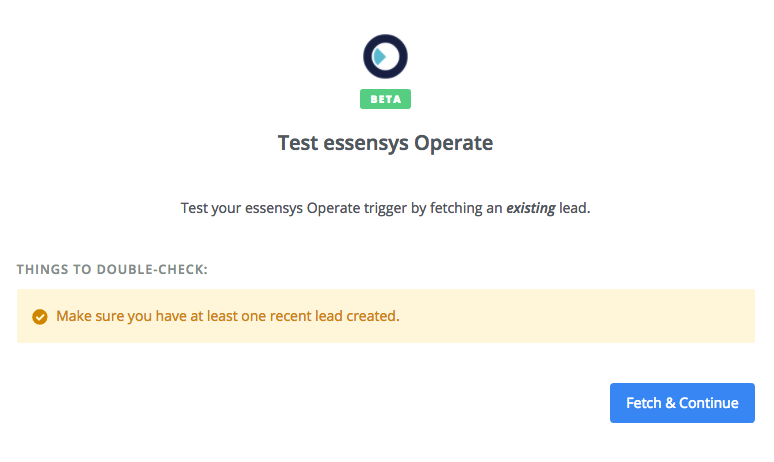 Before creating your first zap, please take a look at the article explaining how to integrate Zapier with essensys (Operate), in case you haven't done so already. A Trigger app - This is the source app, which will determine the rule that triggers your zap. 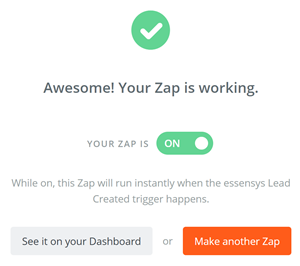 This rule is called a "trigger" in Zapier and your zap will only run if this trigger occurs. For example, a trigger app can be essensys (Operate) and the rule that makes your zap run can be a new lead created into essensys (Operate) (which we will look into within this article). An Action App - This is the app where your desired action should take place if the trigger occurs. 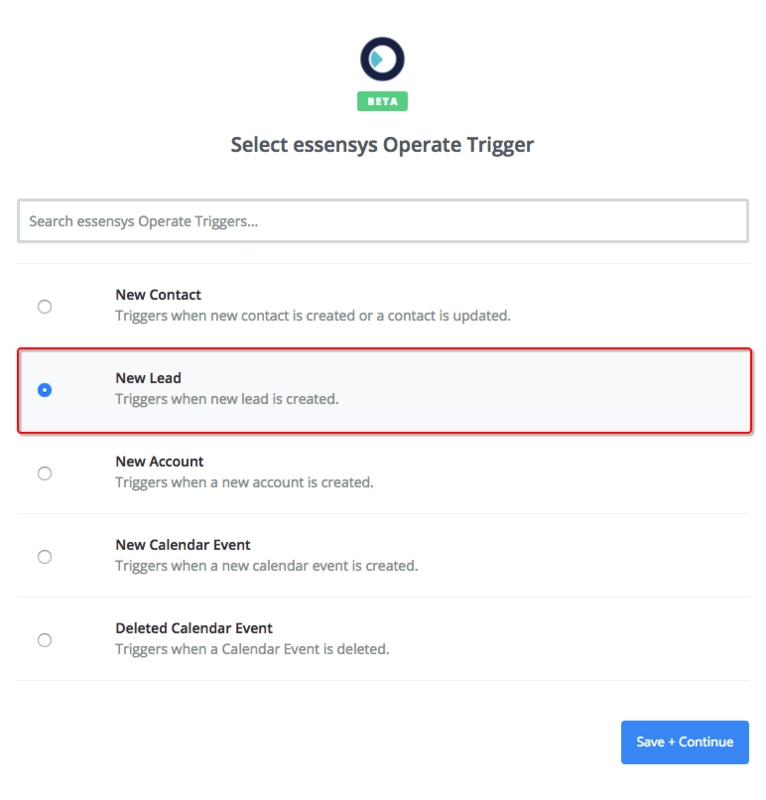 In this guide, we will look at how to create or update a Mailchimp subscriber when a lead is received into essensys (Operate) . 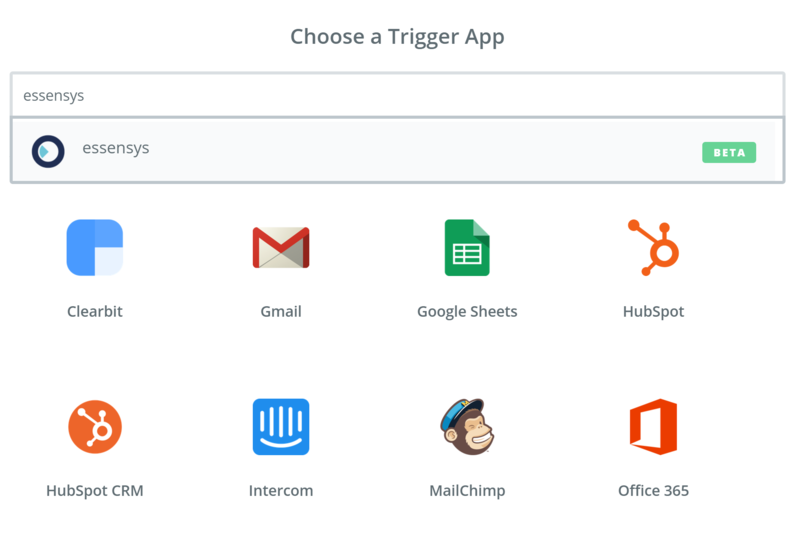 Zapier will now ask you to select your trigger app. Find the essensys (Operate) app in the list or search for it using the search box. Now select a trigger action from the ones available within within essensys (Operate). For the purpose of this guide, we will select 'New Lead' Click Save + Continue when you are ready. In order for your zap to work, you need to log into your essensys (Operate) account. 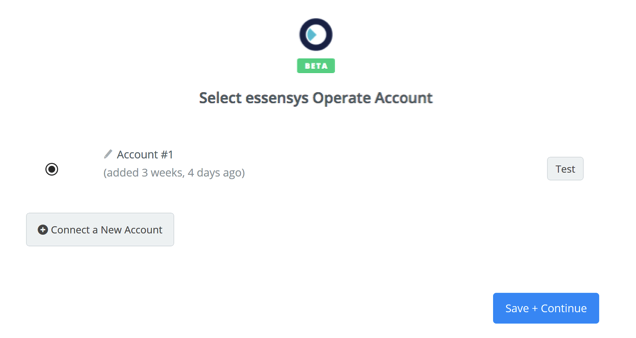 Please select it in the list if you have already connected one or click Connect a New Account and log in with your essensys (Operate) credentials. You will then be able to select this account every time you create a zap. Click Save + Continue when you are ready. Note: This step will differ depending on the trigger you select for essensys (Operate) . For example, if you were to select 'Calendar Created' then you would need to create a test booking instead of sending a lead. Next, search for the Mailchimp app in your list, then select it. This step determines what action the zap will take when your lead is received in essensys (Operate). 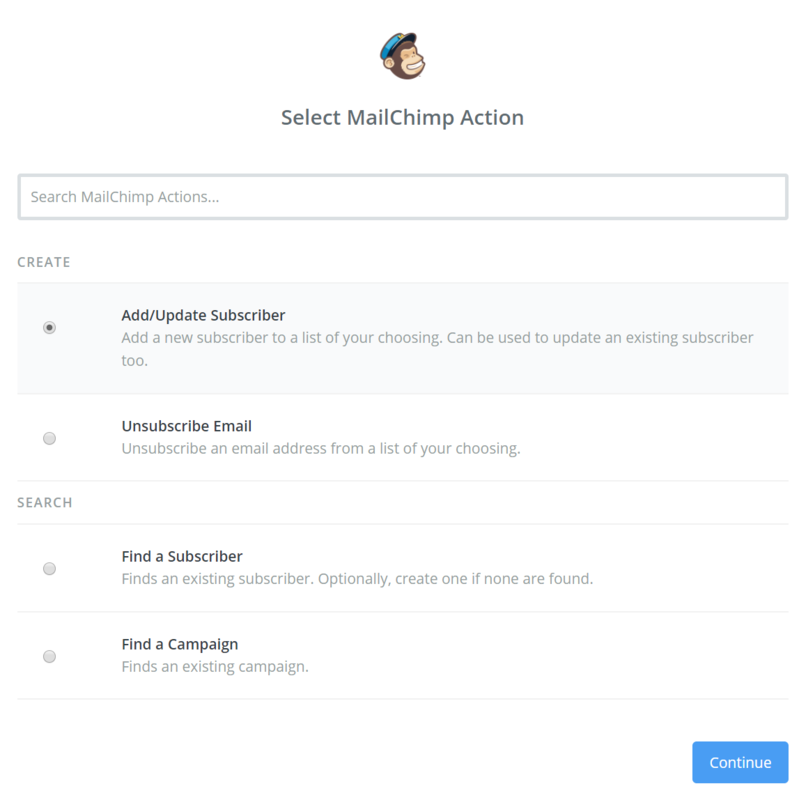 For this guide, we will choose to create/update a Mailchimp subscriber. 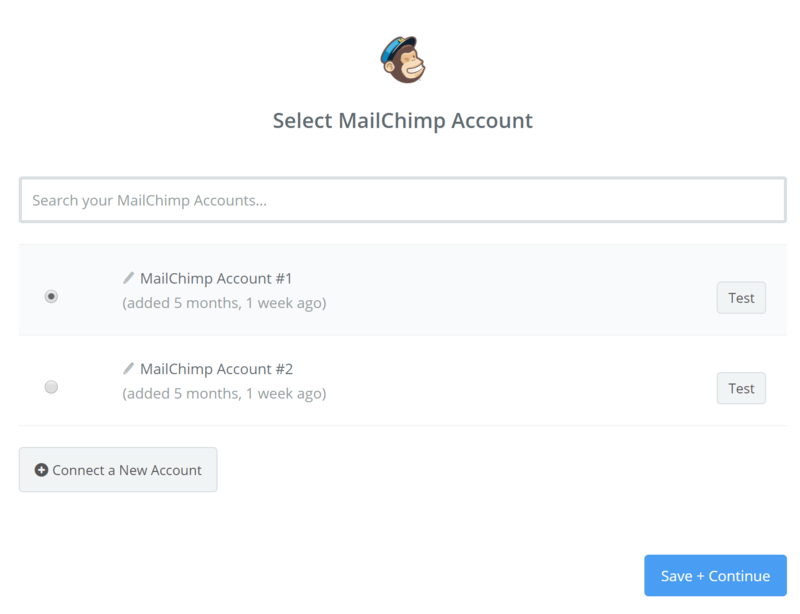 Now select a Mailchimp account or connect to one if you haven't done so already. Click Continue to proceed. 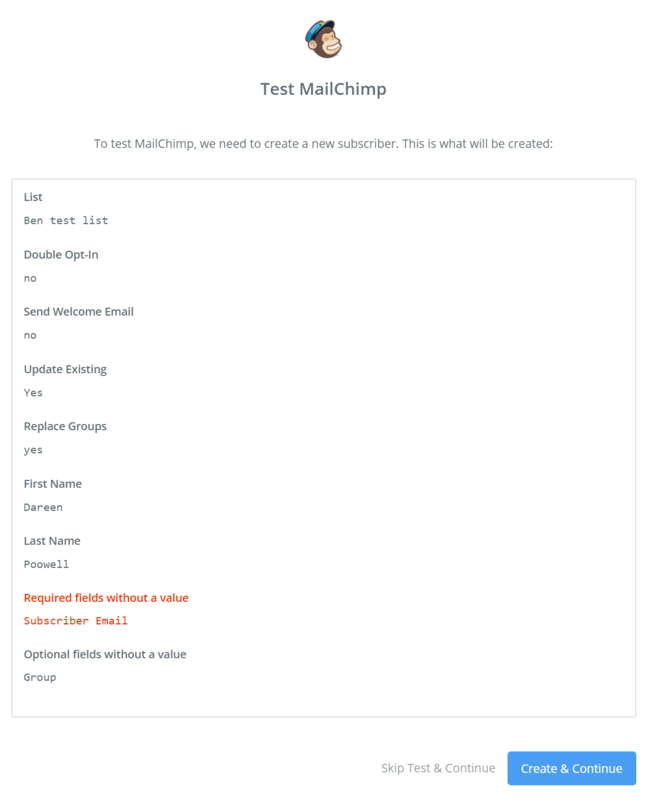 This is where you can configure exactly how you want Mailchimp to act when your new subscriber is created. First select the list to which you want the new subscribers added. Zapier will automatically allow you to search through all of the lists available within your Mailchimp account. You can also select "Use Custom Value" and add an essensys (Operate) merge field. Read more on using custom values in a zap. Add the subscriber email.. This is the email address of the subscriber you want to subscribe to this list. Here you can use an essensys (Operate) Merge field by filtering the field. Press the filter button on the right then search for the "emailaddress" merge field. Select whether you want to send a welcome email - If yes, the welcome email you defined in Mailchimp will be sent to the address. Next, you can choose whether to update an existing subscriber - If no, the Zap will fail if the subscriber exists, otherwise overwrites data sent. Replace Groups if needed - If yes, this will overwrite any existing Groups a subscriber has, otherwise just adds them. Place the subscriber in a specific group - Here you can create a group or select from one of the existing ones in Mailchimp. You can also select "Use Custom Value" and add an essensys (Operate) merge field. Read more on using custom values in a zap. Add the first and last name that will be associated to the subscriber - here is where you can also use essensys (Operate) merge fields, by filtering and using "outputvalue firstname" and "outputvalue lastname" respectively. 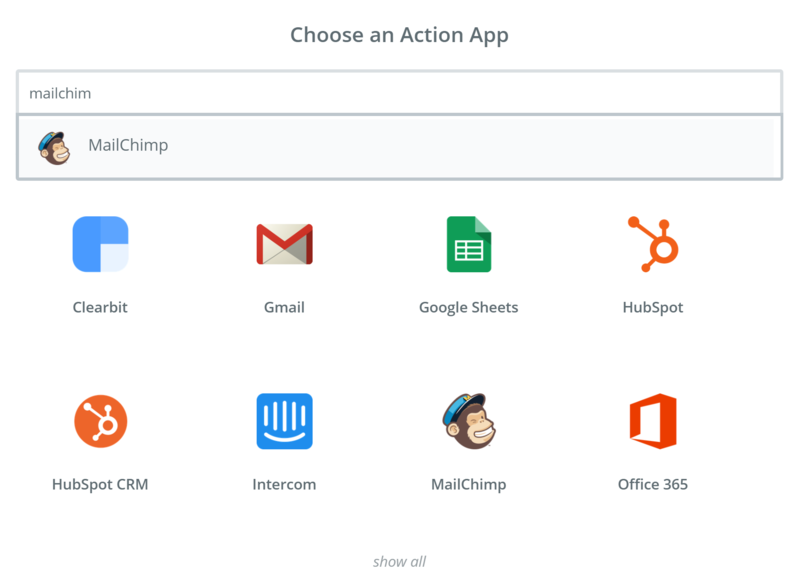 Zapier will now show you an overview of your zap action, which contains the actions that will be taken in Mailchimp.